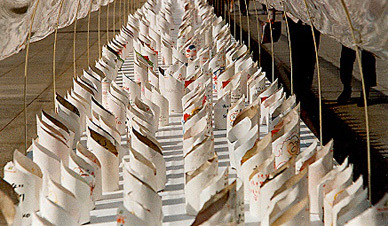 Hibakusha is the Japanese word for survivors of the atomic bombings of Hiroshima and Nagasaki. The relationship between Hibakusha and Madison Quakers, Inc. came about after being introduced to each other by Professor Hiroshi Fujimoto of Nanzan University in Nagoya, Japan. Professor Fujimoto teaches American foreign policy with a special emphasis on the American War in Vietnam. He had been following Madison Quakers, Inc. and Mike Boehm’s humanitarian projects in My Lai for years and in 2004 brought his seminar students to My Lai for the first time to participate in MQI’s projects there. This visit to My Lai began the close relationship between Prof. Fujimoto and Mike Boehm and resulted in Mike being invited to Japan many times in the ensuing years to give presentations on MQI’s work in My Lai and elsewhere in Quang Ngai province. These presentations, especially those in Hiroshima, led to meetings between Mike and Hibakusha, led by Prof. Shoji Sawada who survived the atomic bombing of Hiroshima, where they discussed the similarities between My Lai and Hiroshima; both were horrible killing fields and yet from both hope had arisen through the Hiroshima Peace Park and the My Lai Peace Park. These discussions then began to focus on the similarities of the effects of radiation and Agent Orange; the high incidence of cancers, genetic damage passed on to their children, the stigmatization that resulted within their two societies and more. These discussions culminated in the visit to My Lai on March 16, 2008, the 40 year anniversary of the My Lai massacre, by four Hibakusha led by Prof. Sawada. Traveling to My Lai with the Hibakusha were more than 80 people from Japan, many of them former protesters against the American War in Vietnam. Peace Candles at the Hiroshima Peace Park. Visitors were invited to write their wishes expressing their visions of peace on the paper wrapped around the candles which would then be lit at night. After participating in the ceremonies commemorating the 40 year anniversary of the massacre the Japanese delegation, again led by the Habikusha, visited the My Lai primary schools funded by MQI. 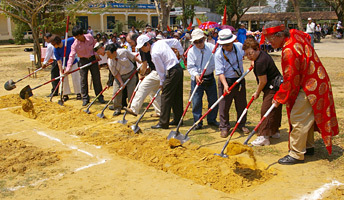 There they broke ground for the third two story, eight room primary school for My Lai. After the ground breaking Prof. Sawada read a powerful statement of solidarity between Hibakusha and victims of Agent Orange. Prof. Sawada then invited representatives of the victims of Agent Orange to Japan the following August to attend the annual conference against A and H bombs in Hiroshima and Nagasaki. During the conference Hibakusha regularly announced their solidarity with victims of Agent Orange. It was while attending the conference in Hiroshima with the Vietnamese delegation that Mike met, by chance, Dr. Sharier Khateri from Iran. Dr. Khateri was attending the conference hoping to introduce the plight of the victims of gassings by Saddam Hussein. He was very enthusiastic about the relationship that had developed between the Hibakusha and Agent Orange victims and hoped the victims of the gassings would be welcomed into this new relationship. These meetings were historic. For the first time the victims of savagely brutal attacks reached beyond their own suffering and embraced the victims of other such attacks. We don’t know where these new relationships will go, maybe they’ll go nowhere. After all, the average age of Hibakusha is in the mid-eighties. But we must ask ourselves who has more moral authority than the victims themselves and if they call for peace and the end of weapons of mass destruction then it behooves us to support them as much as we can. 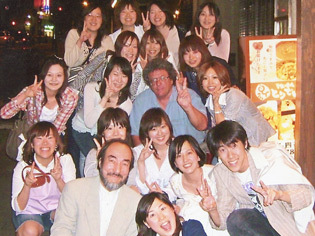 Mike Boehm with seminar students from Prof. Hiroshi Fujimoto's class. March 16, 2008, the 40 year anniversary of the My Lai massacre. Hibakusha, to the right of Mike Boehm, break ground for the third two story, eight room primary school for My Lai funded by MQI. This building was completed January, 2009. 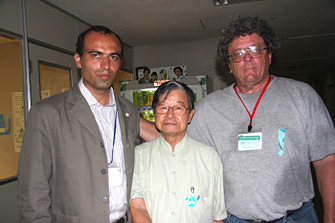 From left to right, Dr. Shahriar Khateri, Prof. Shoji Sawada and Mike Boehm. The victims of My Lai and the Hibakusha have in common is the hope that has arisen from both sites. This was the theme that was stressed when the survivors of the atomic bombings and the survivors of the My Lai massacre met in 2008. Who can deny the moral authority of such victims and their message of hope and world peace? That this meeting could be made possible at all was due to the efforts of Professor Hiroshi Fujimoto of Nanzan University, Nagoya, Japan. Vietnam, the American War in particular, has been his teacher since his high school days. The triumph of life over death. 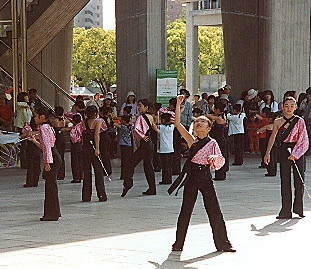 Japanese girls practicing baton twirling at the Hiroshima Peace Park. Our hope is that this will lead to further meetings with other victims of atrocities such as the survivors of Auschwitz or Darfur or Cambodia or any of the many killing grounds that exist around the world.